Starting Tuesday, August 1, 2017, Golf Manor residents will be able to recycle unwanted clothing, shoes and home goods with free, curbside pick-up on regular recycling days. 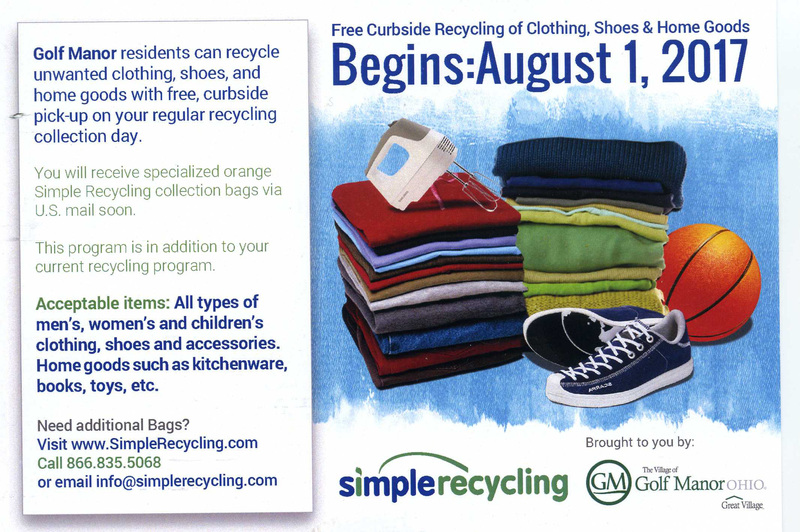 Through a new partnership with SimpleRecycling, residents will receive specialized orange bags via U.S. mail to collect all types of men’s, women’s and children’s clothing, shoes and accessories. In addition, home goods such as kitchenware, books and toys will also be eligible for pick-up in this program. This program is offered as a service to residents in addition to the regular recycling program being offered through Rumpke. Additional bags may be obtained by visiting www.simplerecycling.com or by calling 866-835-5068, or you can email info@simplerecycling.com. This program will help to keep additional used goods out of land fills and direct items to better recycling alternatives.